So now that we have addressed a few of the issues relating to understanding the inherent limitations contained within the U.S. Customs data, let’s look at the processes we (at CenTradeX) employed in parsing, normalizing and enhancing this data. Every Trade Intelligence provider has their own approach to processing the data, along with their own particular brand of “spice” they add as well as the tools utilized to search through and display the data. Notwithstanding, the best few have many things in common. Therefore I believe the following explanation may be both enlightening and educational, whether or not it is precisely mimicked. First of all, let’s take a look at the “big picture”. 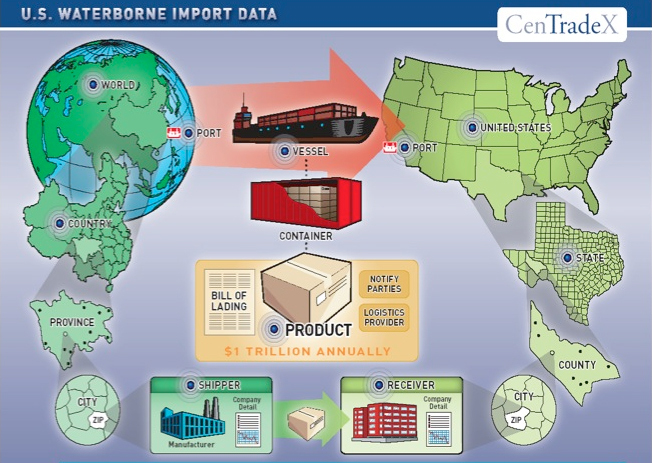 As reflected in the illustration below, Customs data contains detailed records – bills of lading – of the particulars of each and every transaction between foreign shipper and U.S. receiver for waterborne freight. The Big Picture of Customs Data and the trade related information packed therein. As I’ve mentioned, Customs data is distributed (as a “flat file”) on a daily basis as the BOLs for various arriving “vessels” are cleared at the respective U.S. ports. 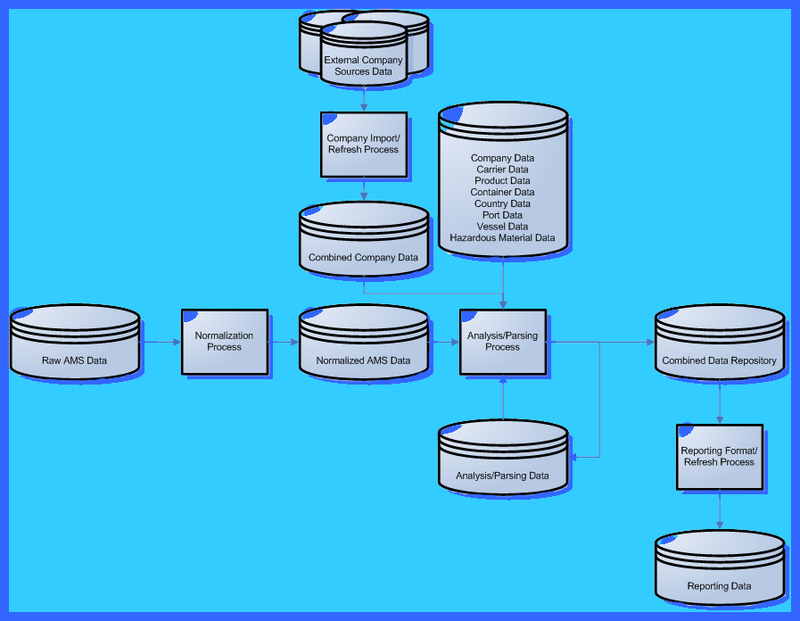 The first, rather arduous process, is to “normalize” data into usable, organized elements contained in a relational database. We found that the best, most efficient method to add accuracy and value to Customs data, after the initial normalization process had been completed, was to connect it with our other comprehensive company and referential databases. 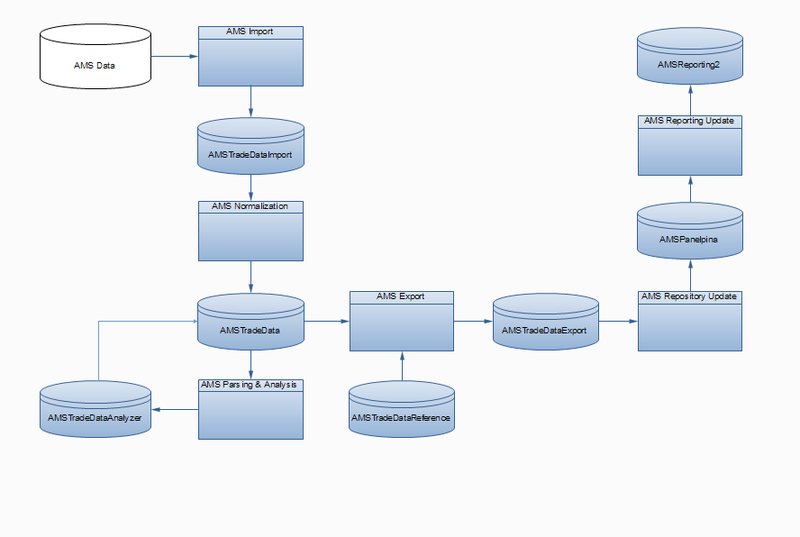 After going through many elaborate transitions, this enhanced customs data was ready for “show time”. We found that the more relevant ancillary databases we were able to connect to the Customs data, the more dimensionalized and powerful the individual portraits of trade and the underlying traders became and the broader the business applications and potential. Connecting the Dots. 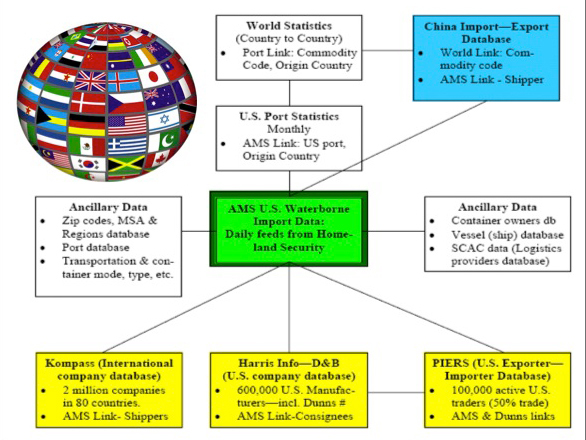 Ancillary data sources to Customs data. Trade Intelligence begins with data. It is the fundamental building block from which dynamic business applications are crafted. To make delicious, even digestible Trade Intelligence you must adhere to some basic steps. Get good, accurate, timely data. Scrub it up, remove the “dirt”. Mix it with other good data. 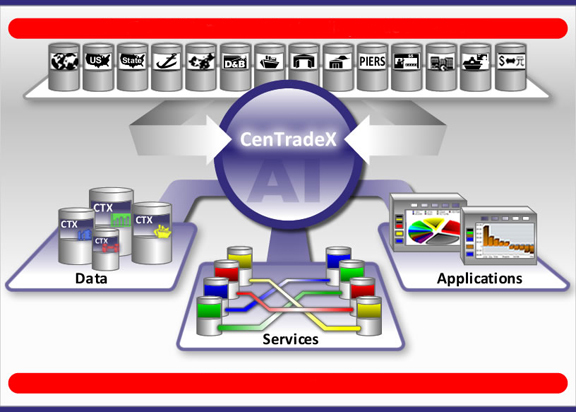 At CenTradeX, we worked with many clients to develop innovative International Trade Solutions, some of which incorporated daily transactional Customs data toward the objective of assisting their staff and customers to find and take advantage of global business opportunities both here and abroad. Several of our applications, namely Prospects (and its hybrid interface for the financial community – Trade Finance) and Stats Plus were acquired and now marketed by UBM Global Trade /PIERS. Several other Trade Information providers have developed some very powerful and cool applications incorporating U.S. Customs data. 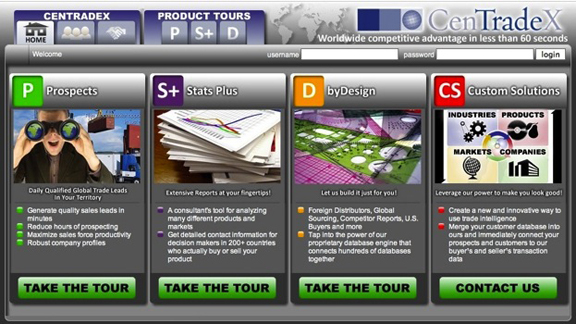 Check out the top navigational menu of this site under T.I. Providers Links> Transactional, Article Categories> Suppliers as well as Trade Blogs> T.I. Providers and Video Library> T.I. Providers for more information on these companies and the products and services they offer. Also, please refer to our Commercial Services Menu on the top navigational bar of this site for information on Application Licensing, Research & Writing Services, Database Repositories, Artificial Intelligence Engine as well as other Consulting, Project Management and Application Development Services.